I recently read a tagline for a minor-Christian 'celebrity' pastor that has ironically been used for dozens of speakers in recent years: [Insert Name] is the pastor of the 'fastest growing' church in America. Well, get ready buddy, because somebody else will soon be the taking your place. You might have been the fresh face last week… but you'll get stale pretty quick. Or, said another way: You'd better top yourself next week. Or, from another angle: Your attendance better keep growing. Or, in a self-awareness: I feel like I'm more of an event-planner than a pastor. Jesus didn't seem to feel the pressure to one-up himself every week. When the masses wanted to crown him with their agenda, he resisted. When the crowds grew, he went off to pray. If he had 2-3 gathered, he was truly satisfied in their midst. In fact, something about the people's celebritization of his work troubled him. He was after something more from people than recognition and glory… he wanted patient, long-term change. He always had wanted that… from Genesis three through Revelations 21. What explains the dip in attendance? I suppose the food wasn't good enough? Or maybe Jesus didn't book the right entertainment or market a sell-able controversy. Was Jesus not successful? Well, according to our gauge, he was not. And that should tell us that the gauge we use is the wrong instrument for the work we do. 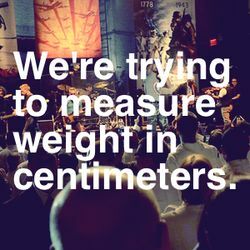 It's like we're trying to measure weight in centimeters. What should be the standard for success in ministry? What is it that Jesus was after in ministry… and shouldn't this be our goal? What if we emphasized the normal days rather than the big events – how would our patterns of ministry change— how would the long-term effectiveness of ministry change? May we pursue the patterns of Jesus in our pursuit of ministry. Were you in our office? Where you in our living room? Were you in our bedroom (ie: pillow talk)? We are on the office floor this is so right on. -Wide & shallow – or narrow and deep? -Just had a phone conversation as someone was inquiring counsel on these very questions. 1) DREAM big – but be sure they are God’s dreams (His vision perfect will vs. idol of agenda). 2) Remember – “Your WHO (you are in Christ and hearing His voice) is to lead your DO, NOT your DO MAKE your who.”-My quote I learned the hard way. 3) Be ready – to promote someone else to take your place doing it so you can go on to the next thing and do something someone else cannot do. 4) Remember – Always be sure to look that the next ‘new wave’ as it may just be a splash. NOT to be cynical, but to look before you dive in over your head, then find after the tsunami subsides that you have been left high and dry (Many a ‘worker’ has sat on our couch dripping wet wondering what happened). See it for the true what, when, and why it is and love & embrace it keeping YOUR motives right and pure. This will help you to see the longevity the work will have. Then you can adjust your heart and hands accordingly and know when it’s time to get out of the water or drain the pool. 5) “You will know them by their fruit.”…Lasting fruit.